True Multi-master, Active-Active Cluster Read and write to any node at any time. Automatic Node Provisioning No need to manually back up the database and copy it to the new node. Transparent to Applications Required no (or minimal changes) to the application. An additional benefit of Galera Cluster is good cloud support. Automatic node provisioning makes elastic scale-out and scale-in operations painless. Galera Cluster has been proven to perform extremely well in the cloud, such as when using multiple small node instances, across multiple data centers—AWS zones, for example—or even over Wider Area Networks. The basic difference between synchronous and asynchronous replication is that “synchronous” guarantees that if changes happened on one node of the cluster, they happened on other nodes “synchronously”. “Asynchronous” gives no guarantees about the delay between applying changes on “master” node and the propagation of changes to “slave” nodes. The delay can be short or long – it is a matter of luck. This also implies that if master node crashes, some of the latest changes may be lost. transactions can be executed on all nodes in parallel. However in practice synchronous database replication was traditionally implemented via the so-called “2-phase commit” or distributed locking which proved to be very slow. Low performance and complexity of implementation of synchronous replication led to a situation where asynchronous replication remains the dominant means for database performance scalability and availability. Widely adopted open-source databases such as MySQL or PostgreSQL offer only asynchronous replication solution. An alternative approach to synchronous database replication using Group Communication and transaction ordering techniques was suggested by a number of researchers (e.g. Database State Machine Approach and Don’t Be Lazy, Be Consistent) and prototype implementations have shown a lot of promise. 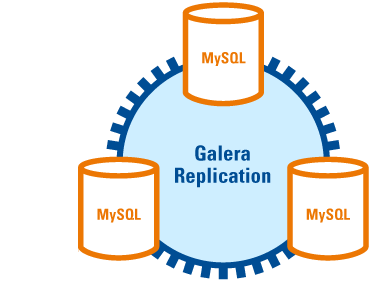 We combined our experience in synchronous database replication and the latest research in the field to create Galera Replication Toolkit. wsrep hooks is the wsrep integration in the DBMS engine. Traditional MySQL master-slave topology, but with Galera all “slave” nodes are capable masters at all times, it is just the application who treats them as slaves. Galera replication can guarantee 0 slave lag for such installations and due to parallel slave applying, much better throughput for the cluster. With WAN replication topology, cluster nodes can be located close to cilents.Therefore all read & write operations will be super fast with the local node connection. The RTT related delay will be experienced only at commit time, and even then it can be generally accepted by end user, usually the kill-joy for end user experiences is the slow browsing response time, and read operations are as fast as they possibly can be. Online services today face 3 requirements that are driving the choice of a database clustering solution: 1) The need for continuous operations and greater level of high availability than was traditionally needed, 2) ability to scale-out when service popularity grows – jumps of 20 times overnight increase or more are common, 3) ability to scale-in minimizes infrastructure costs when running on cloud technology. Increasingly, the cost of downtime can be measured directly as lost revenue per second. Studies have estimated that businesses lose $5000 per minute, or $500,000 per outage due to service downtime. Inability to scale-out when needed will similarly incur lost business transactions – often at the very moment when there was a unique opportunity to grow the business! Read the whitepaper here from the link below!